A Soul Art Mandala is a channelled form of graphical reading that bypasses the conscious mind, and speaks directly to the Soul. Your mandala will be accompanied by a full written interpretation of the symbology held within, as channelled during creation. You are welcome to choose a particular focus – examples of business, home, child, relationship, the upcoming year – or simply trust that your mandala will reveal whatever magic is needed. Several hours goes into hand drawing/painting each mandala and you’ll have the ongoing joy of a beautiful piece of personalised art to enjoy for years to come. Your mandala will be accompanied by a full written interpretation of the symbology held within, as channelled during creation. I work with the assistance of many spiritual guides and incorporate vibrational crystalline energies, numerology, colour energy, ancient symbology and so much more in all aspects of my work. Soul Art Mandalas can be incredibly insightful and the written interpretation is there for you to refer back to time and again as you continue to work with and enjoy your mandala. 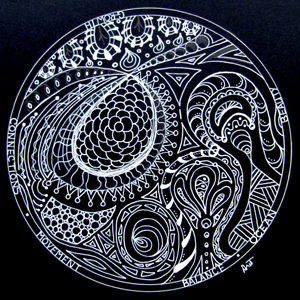 A mandala – Sanskrit for ‘circle’ – creates a sacred space which represents wholeness. The form of the mandala is a graphical representation of the center – or Self. It unlocks and bypasses your conscious mind and speaks with your Soul. Mandalas are naturally beautiful to view and great for energizing any space. Examples of mandalas can be found in all ancient cultures. Working with mandalas can be a very powerful and transformative process. With focus and intention, they act as a powerful meditation tool – making them hugely potent in supporting re-balancing and healing on all levels. Available with or without framing and worldwide postage is available. Soul Art Mandalas also make wonderful gifts. Please note readings cancellation policy which you will be asked to accept at time of booking. Please check your inbox after placing your order – you will be asked to provide a full name, date of birth and photograph showing the face. Please also indicate whether you’d like a general reading or particular focus for your mandala. 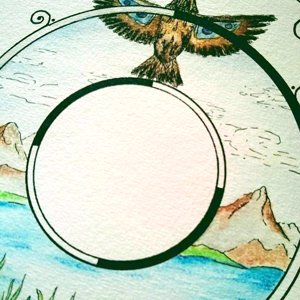 An electronic copy of your mandala and accompanying interpretation will be delivered to your inbox when complete. You can choose to collect the original from Happy Valley, Adelaide or I am of course happy to post for postage costs covered. 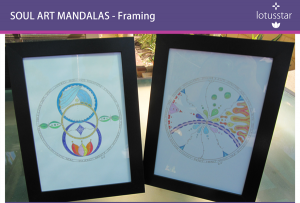 Framing is available at cost for mandalas being collected only. Soul Art Mandalas also make wonderful personalised gifts, they are remarkably insightful and great for energizing any space.